In ancient Europe, time was told predominantly by the sun and years were separated into two seasons: Summer and Winter. The turning of the Wheel was marked by agricultural growth, both related to livestock and to crops. Rural celebrations marked the beginning and ending of each period, with sacrifices to the gods and festivities honoring the changing of the seasons. In between the work continued, and with it came more prayers, sacred offerings, and everyday devotions. An outsider looking in on each ritual in each rural village would likely see little difference between the two festivities, although many details have been lost to time. In modern times, however, two festival days are ripe with magick and mayhem: Walpurgisnacht (or Hexennacht) and Beltane. This year, five of us worked together to share with the community a weekend of festivities, beginning on Saturday night’s April Full Moon ritual with a Walpurgisnacht experience, and continuing into Sunday morning with a Beltane festival. For the Night of the Witches, Courtney acted as guide, bringing participants forward and assisting them through the experience. Rose, Heather, and S.J. each evoked a Norn: Urd, Verandi, and Skuld, respectively. The tree at Lassiter Mill Park took on the role of Yggdrasil. At one end of the field where mighty Yggdrasil stood, the Norns, as depicted in Macbeth, awaited. 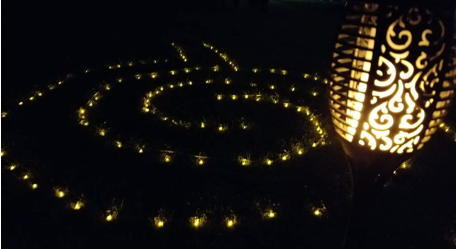 The middle of the field was aglow with a spiral labyrinth. Guests arrived and waited at the far end. As attendees walked the labyrinth, the Norns determined their meeting place and then set to making their potion. Then one by one, attendees approached the Norns at the base of Yggdrasil starting with Urd as she spun, Verandi as she measured, and Skuld as she cut. Each attendee received a sliver of spun thread to place into a glowing cauldron which offered divinatory insight into the question they presented to the Norns. While not a traditional circle, the purpose of this night was to bring the local Pagan community together and highlight the bonds of our shared traditions—each individual thread woven together to create a single beautiful tapestry. The next morning, our community gathered again with Stephanie, Courtney, S.J., Rose, and Heather leading to round out the weekend. An interactive altar was set up for divination and messages of love and admiration, both for oneself and for others in attendance. May the energy that we have raised here spark within our hearts a sacred fire. May this fire burn away the last vestiges of winter within ourselves and bring healing, life-giving energy to our spirits. May this sacred fire burn outward from our hearts to surround each other to pass from one to another within our community, multiplying each time the fire is passed along. May our fire burn outward to Raleigh, Durham, and Chapel Hill. May the fire move outward, strengthening and bringing joy to the United States…North America…the whole world…the universe. May we call upon this sacred fire whenever it is needed. As within, so without. As above, so below. As the Universe, so the Soul. After the visualization and service of cakes and ale, the ritual became a festival with a community potluck, story time, songs, laughter, glitter, and revelry.